Blood supply: Segmental extraneural and intraneural branches from the superior ulnar collateral, inferior ulnar collateral, and posterior ulnar recurrent arteries. The inferior ulnar collateral artery provides the only direct vascularization proximal to the cubital tunnel. (Yamaguchi K, JSES 1999;8:17). 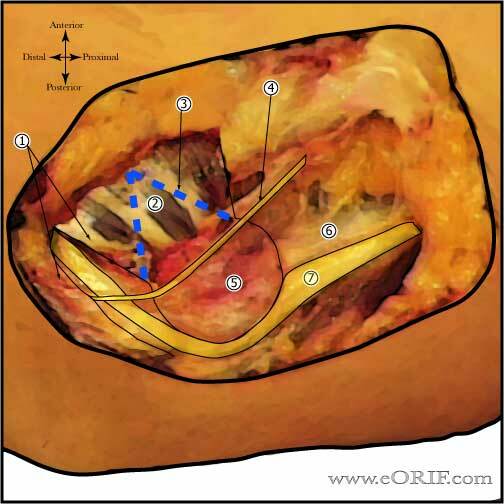 Failure of non-operative treatment of cubital tunnel syndrome. Subcutaneous transpostion is relatively contraindicated in thin patients with litte subq tissue. Medial epicondylectomy. (MuermansS, JSES 2002;11:248). Simple Decompression. (Nathan PA, J Hand Surg 1995;20Br:628). Supine position with elbow flexed @ 45 degrees on hand table. All bony prominences well padded. Examination under anesthesia. Evaluate for ulnar nerve subluxation. Mark out medial epicondyle, tip of the olecranon, flexor pronator muscle origin, and ulnar nerve location. Curvilinear 10 cm incision over the ulnar nerve centered between the medial epicondyle and olecranon. Dissection done under 2.5x/3.5x Loop magnification. Identify and preserve branches of medial antebrachial cutaneous nerves which are more evident distally in the incision. Identity ulnar nerve just proximal and posterior to medial epicondyle. Elevate thick fascial layer overlying the nerve and release it longitudinally along the nerve. Decompress until the fascia of the FCU is reached. 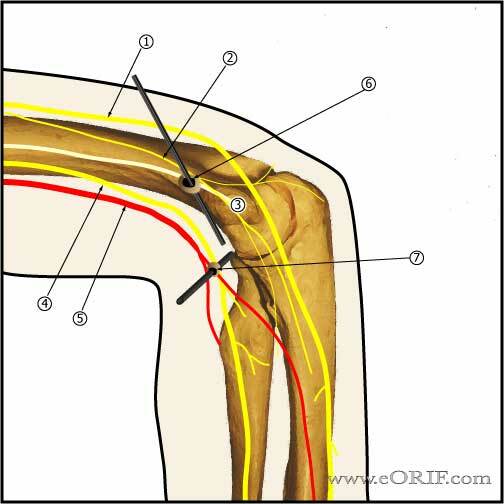 Carefully elevate and divide the fascia of the FCU taking care to protect any ulnar nerve branches. Release any fascial bands proximally including the Ligament of Struthers if present. Identify the intramuscular septum distally which is just anterior to the ulnar nerve. Coagulate any small bleeders around the septum. Resect 2-3cm of the medial intramuscular septum distally from the medial epicodyle/humerus to prevent tethering of the transposed nerve. Mobilize the ulnar nerve with a cuff of tissue including its blood supply(inferior ulnar collateral artery) and transpose it over the medial epicondyle. Fashion a 1.5cm wide fascial sling from the flexor pronator fascia and tie it to the subcutaneous tissue to keep the nerve in its transposed position. Recheck the nerve and its landing zone confirming that it is free, not tethered throughout a full ROM and returns to its normal position without kinking distal to the epicondyle. Posterior numbess, Painful neuroma, CRPS, Stiffness, Continued symptoms (paresthesias, weakness, pain). Post-op: allow immediate gentle ROM. No strengthening / lifting heavier than pencil. Submuscular transpostion spling at 45° for 4-6 weeks. 6 Weeks: Strengthening / lifting allowed. 3 Months: Resume full normal activities. 92% satisfied patients. 73% excellent, 18% good, 4% fair, 6% poor. (Black BT, JBJS 2000;82Am;1544). Patients with pain and paresthesias only typically have good outcomes. Advanced disease with objective numbness and weakness have decreased outcomes.